The Nevada marijuana industry is highly regulated, and agents, cultivators, owners and board members are required by law to obtain Marijuana Work Cards in order to own and/or work in a marijuana establishment. As an approved vendor for the Nevada Department of Taxation, Fingerprinting Express has processed a high volume of fingerprints for medical and recreational marijuana agent work card applications. Make sure you choose a seasoned vendor to process your fingerprint background check. Using a fingerprint vendor with less experience may result in a delay in employment. Print out your work card application and fill it out. Bring the Agent Fingerprint Submission Form (page 13) to one of Fingerprinting Express’s four convenient locations. We will submit your fingerprints electronically via Livescan, and the technician will sign, date, stamp, and note the TCN number (if applicable) on your fingerprint submission form. Submit your completed packet, along with the $75 registration fee (per category), to the Nevada Department of Taxation. Note: If you will be working for a “dual licensee” establishment (one that is both a medical and recreational establishment), you will need to be fingerprinted twice because Legislature passed Medical Marijuana first and Recreational under a separate law, legally each establishment has to have its own reason for fingerprinting. If you currently hold an agent registration card, it will be valid for one year following the date of issue. The marijuana agent work card renewal process is the same as the initial application process. The Nevada Department of Taxation recommends starting the renewal process thirty days before expiration so you don’t risk expiration and a lapse in employment. At Fingerprinting Express, we pride ourselves on being your single source for marijuana agent work card application requirements. Not only can we provide fast, accurate Livescan electronic fingerprinting, we can also make copies of your identification, take your photo and attach to your paperwork so you have everything you need to complete your work card application with one easy stop. 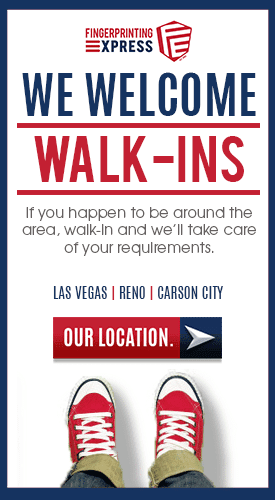 Walk in to one of our modern, comfortable locations at your convenience or book an appointment online. Q: What do I need to bring with me when I come to get fingerprints for my marijuana agent work card? A: You will need a valid government-issued photo I.D., your Agent Fingerprint Submission Form, and a payment method (cash/card). Don’t worry, if you forget your form we have extras for your convenience. Q: Can I have fingerprint cards done instead of Livescan fingerprints for my work card? A: No. Livescan electronic fingerprint submission is required for Nevada residents. Only those having fingerprinting done in other states will be required to use physical fingerprint cards (FD-258).